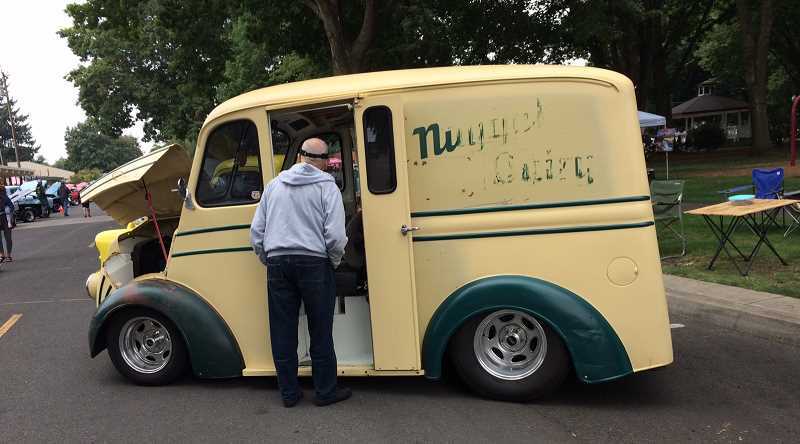 The sun was shining, at times, the weather cool and comfortable as hundreds of cars and people came to Canby to see the city's Big Weekend Cutsforth's Cruise-in by the Park. There were great big cars, and some very small cars, there were old cars, kit cars and even an Edsel, pickup trucks, some cars hung low on the ground while others stood on tires that were too big, some were super charged while others put Ford engines in Chevy bodies. One street had Triumph Roadsters all in a row with an older Jaguar at the end. 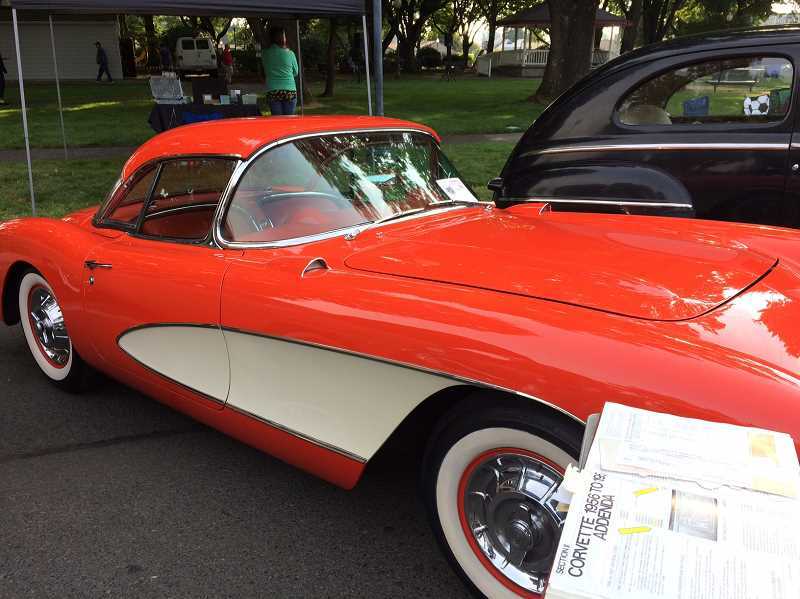 In short, the Cruise-in By the Park was a feast for the eyes and the minds, especially for those whose knowledge of cars typically meant keys and a gas pedal—well maybe a brake pedal too. It was a spectacular show, not just for the cars but for the people too. Some people came from as far away as Hood River and Portland, others from as close as Aurora and Beavercreek. "We had 375 cars preregistered," said Debbie Wright at the registration desk. She estimated there were 487 around 9 a.m. and a total of about 600, a record, compared with 550 last year. "Given the numbers of people from last year, I think there's even more people than last year," with at least 5,000 people crowding the streets by noon. Attractions weren't just the cars, there was music from JBL Productions until 11:30 a.m. and live music from 11:30 a.m. to 1:30 p.m. by Bret Lucich, who spent much of his youth on a 40-acre farm in Canby. At 9 a.m. there was a tribute to the flag, which was held up by a fire engine's ladder and the Rotary Club held a barbecue selling hamburgers, hotdogs and sodas to raise money for scholarships, community services and buying books for elementary school libraries. One booth, just outside Wait Park, showed off the work of Stripes by Spiderman, who had decorated several cars in the show. Don Fite, Spiderman himself, had driven down to the show from Portland. His stripe designs always feature a tiny spider at the bottom. Other booths setup in the park were from Dutch Bros. Coffee, Re/Max Realty, Canby High School Girls Soccer, Music Boosters, World of Speed and Polishers. Nearly 30 businesses helped sponsored the Big Weekend. Trophies were handed out between 1:45 and 2:30 p.m. for 34 classifications including prizes for the six outstanding originals from before 1942, 1943-54, 1955-59, 1960-64, 1965-75 and 1976 on up. Others included fine original interior and custom interior, cool Camaro, convertible, Corvette and cruiser as well as Hot Hot Rod and Elegant Import. Chuck and Beth Saul from Beavercreek brought their orange and white 1966 Corvette, which was one of the featured cars. They are second owners of the car originally owned by Roger Brower from Knauss Chevrolet in Tigard. They bought it with less than 45,000 miles. Brower had replaced the engine and transmission but kept the originals in boxes, which Chuck took and replaced about a month ago. Oddly enough, Beth worked for the city of Canby from 1982 to 2008. She was library director for a number of years and retired after taking on six different departments. Meanwhile, Chuck spent 31 years teaching mostly fifth through seventh grades but also eighth, as well as five years teaching at Linfield College. He taught most subjects from math to English to social studies even physical education and music when the district needed those subjects. Roy Hofer has a 1941 Chevrolet that he lovingly keeps in the same condition it had when he bought it. There was a large plastic black rat sitting on the open engine. He's leaving it as it was when it bought it including the 1941 road maps and pocket ledger because "it's worth more if I leave it to its original condition. Of course, I've changed some of the basic mechanics to make it safe to drive," he said. 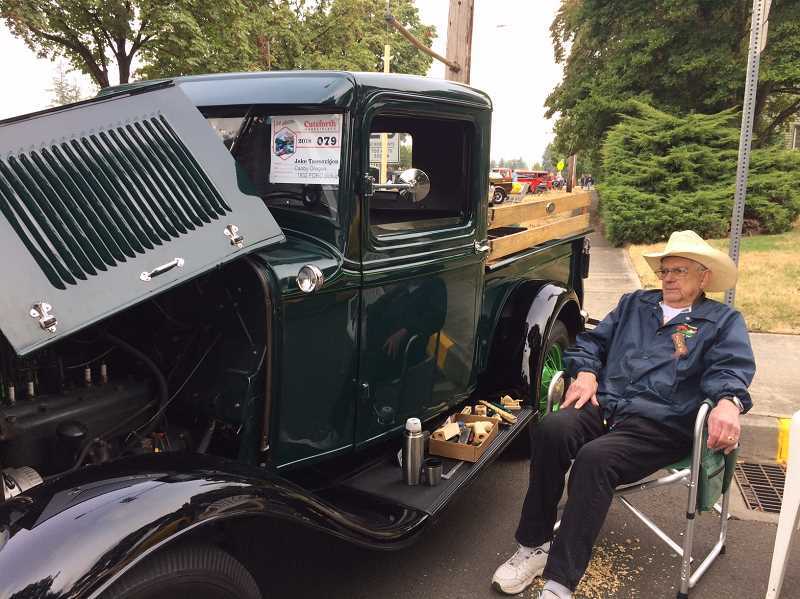 Near Hofer was Jake Taasevigen, who bought his truck in a scrap yard and "…rebuilt the engine and did the machining in Oregon City then put it together in my Canby driveway." The truck reminded some people of some miniature pickup trucks that were used as Christmas decorations last year. He said he comes to the show every year, "unless he's out of town." On one of the running boards, Taasevigen had some wooden items he's whittled and was working on others. "Idle hands are the devil's workshop," he quipped. Catty-cornered from the park a Cadillac Coup de Ville was parked next to a Mazda Miata, which was quite distracting for the eyes. They were parked on the street containing at least 15 Triumphs, some of which were kit cars. The sheer number of cars coupled with the crowds made it a fun and quite entertaining morning and early afternoon.